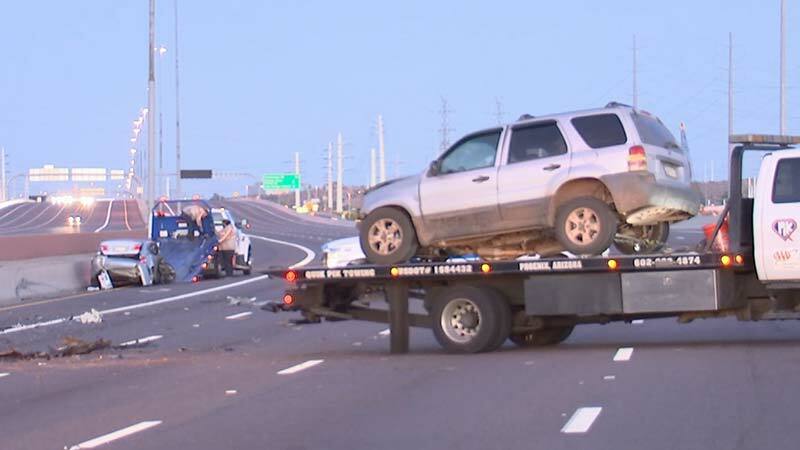 Tempe, Arizona—The westbound lanes of Loop 202 near Loop 101 were closed early Sunday morning after a SUV collided with a total of four vehicles. The chain of events started when a westbound SUV rear-ended three vehicles near Center Parkway. The driver, identified as Jahine Gregg, age 19, fled the scene by turning eastbound and heading directly into traffic, eventually colliding head-on with a vehicle in the HOV lane near McClintock. None of the sixteen people involved was seriously injured, though five were treated and released by fire department personnel at the scene. Mr. Gregg was booked into jail on DUI and multiple counts of endangerment and criminal damage.